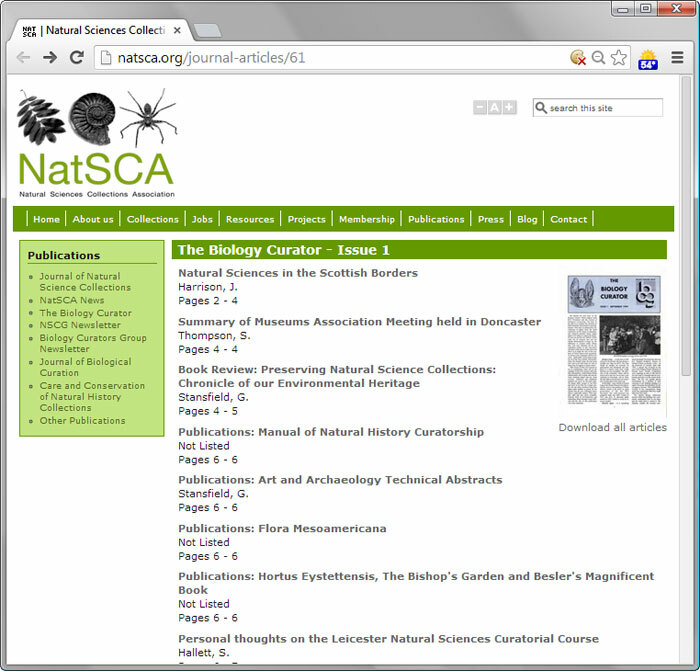 As we moved to our new home here at natsca.org, we also wanted to ensure that the resources that were available through our website were more easily accessible. Our old website contained a publications archive, which included many back issues of our journals and newsletters. However, most of these did not contain a searchable table of contents or permit downloads of individual articles, making it challenging to find specific articles. As we delved further into our archive, we also found that many issues and volumes were missing. Fortunately we were able to locate missing periodicals and to split the publications into their constituent articles, extracting details such as authors, titles and (where provided) keywords. The total number of articles was enormous, many tens of thousands! We would like to thank all of the volunteers who generously gave their time to helping us digitise and organise the archives. Linking this system into Google Scholar, we now have a searchable archive and hope that this will prove valuable to researchers. The new publication archive includes article level listings, including titles, authors and abstracts and keywords where provided. This should make it much easier to find relevant articles.